Half the world's geysers are found within Yellowstone National Park, and most of those are concentrated in a near continuous band of activity along the aptly-named Firehole River, south of Madison Junction, culminating in the largest group of all in Upper Geyser Basin, home of Old Faithful and many other equally large and spectacular erupters. 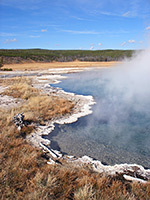 The ten mile expanse contains examples of every other kind of geothermal feature, large and small, in backcountry settings reached by trails, or right next to the road, and several days would be needed to see everything. Old Faithful is also the site of a sizeable village offering every conceivable visitor facility, acres of parking space and several lodges and hotels. Paths to the nearby geysers are always busy, as are other popular sites like Black Sand Basin, Grand Prismatic Spring (in Midway Geyser Basin) and Fountain Paint Pots (in Lower Geyser Basin), but it is still easy to find more tranquil places away from the crowds such as Lone Star Geyser or the River Group in the Lower Basin. 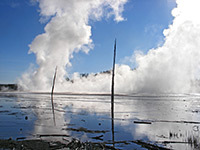 The road through the geyser region - which is divided into the Lower, Midway and Upper Basins - starts at Madison, 12 miles east of the main entrance to Yellowstone National Park at West Yellowstone. 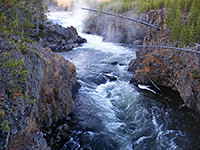 The first few miles encounter no thermal areas, as the road follows the valley of the Firehole River southwards passing two notable waterfalls; Cascades of the Firehole and Firehole Falls, this latter reached by a one-way spur road that runs along the rim of a very steep part of the canyon. Along the main highway, the valley sides soon recede and the land opens out to reveal a large area of meadows either side of the river. This is the Lower Geyser Basin, containing up to ten separate groups of geysers and pools of which half are easily accessed from the road. 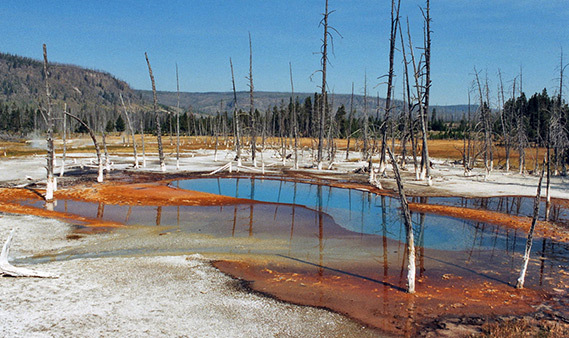 A few miles south, at the far side of the same open area, is the Midway Geyser Basin, with fewer but larger features like Grand Prismatic Spring and Excelsior Geyser. 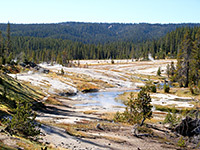 The highway then runs through another short valley and into the Upper Geyser Basin, which has over 250 identified geysers, on both sides of the road, in an area just 1 by 2 miles. 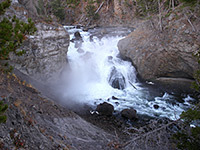 South of here, the Firehole River turns away from the highway at the 150 foot Kepler Cascades, starting point for hikes to two of Yellowstone's backcountry geyser basins - Lone Star and Shoshone. 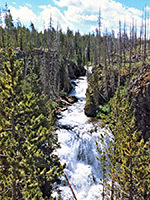 This latter is a varied collection of hot pools and about 40 active geysers, arranged around Shoshone Creek at the west edge of Shoshone Lake, 8.5 miles from the road. The basin can be visited on a long day hike though most people stay overnight at one of two primitive lakeside campsites. Back on the main road, the 12 miles to West Thumb junction encounters wooded, mountainous land, twice crossing the continental divide, and passing several more trailheads including one for the 3 mile hike to the east end of Shoshone Lake along De Lacy Creek.